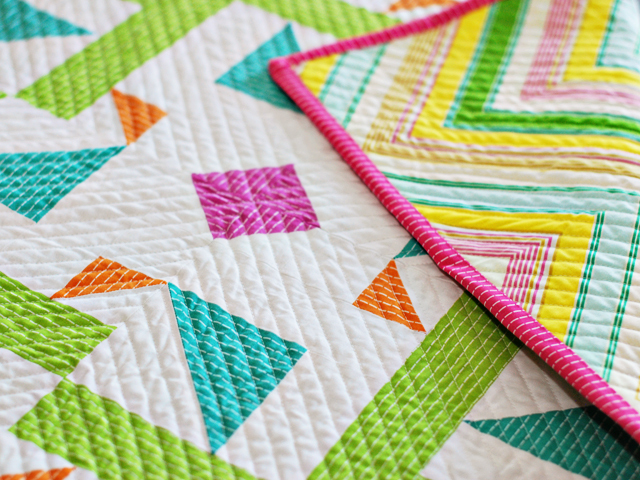 Bijou Lovely: kaleidoscope mini quilt. 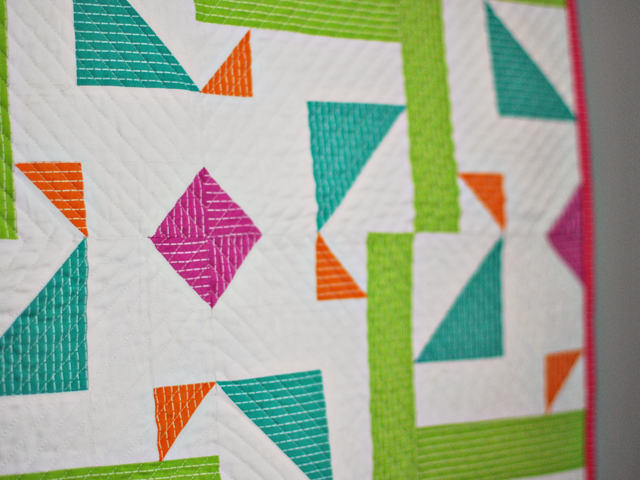 I hope you all enjoyed the Kaleidoscope Quilt Block Tutorial yesterday! 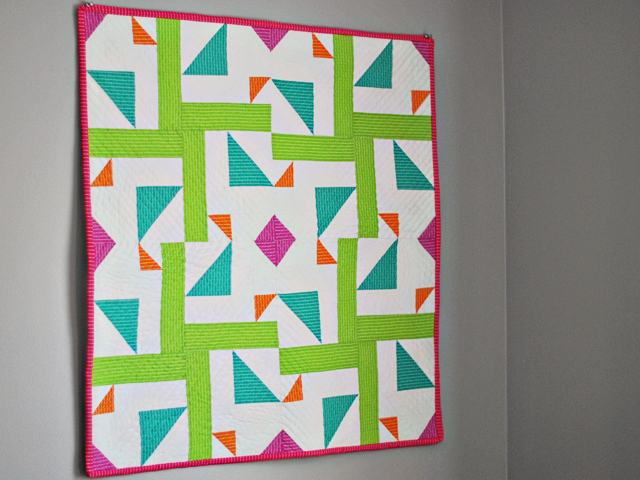 I wanted to share a few more pictures and details about the mini quilt I made with my kaleidoscope blocks. The idea for this block came from a doodle I made on the back of a business card at work. Sometimes inspiration strikes when you're not expecting it! Basically I wanted to use the idea of HSTs in different sizes and orientations that were spaced out within a quilt. I added in the colored rectangles that make the pinwheel shapes (the green in this quilt) once I drew it up in Illustrator, and when I started putting the blocks together I was happily surprised to see the secondary patterns (including the wonky-ish star in the center!) that appeared. It was kind of a happy accident! I used the Running Stitch prints from Patty Young's Lush collection that I had bought recently. I wanted something mostly solid, but I also wanted a directional print so you could tell that I was playing with the orientation of the HSTs. This subtle stripe was perfect, and it doesn't hurt that the colors are so vibrant and springy. I used a hera marker (my new favorite tool!) to mark two lines through the center at a diagonal, and then quilted straight lines in 4 V's starting in the center of the quilt. It was a little bit tedious but luckily since it was only a small quilt I finished it quickly. I backed the quilt in the yellow zigzag from Heather Bailey's Pop Garden, and bound it in the Raspberry Running Stitch print. I think this quilt is REALLY beautiful! I love the design and the colors and the quilting. Perfect! 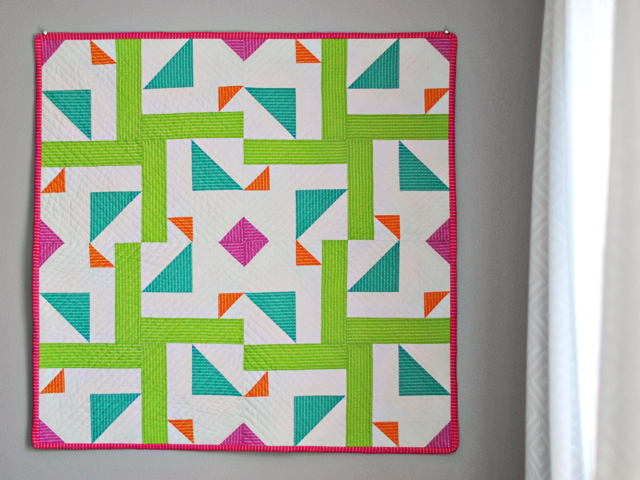 This is a darling quilt and I love the bright colors! 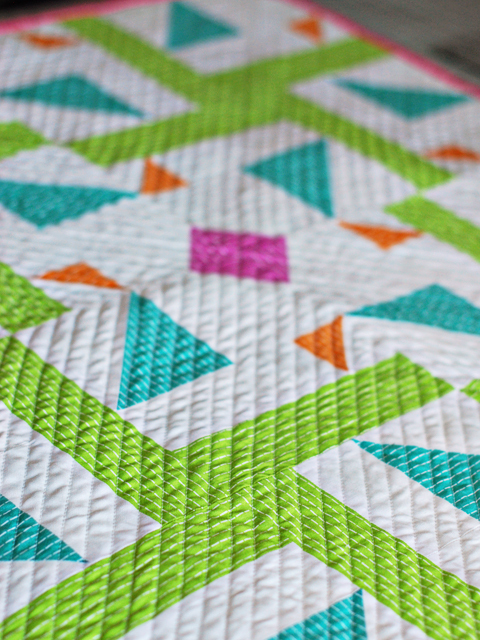 Love the quilting on this - it's a perfect complement to the design! 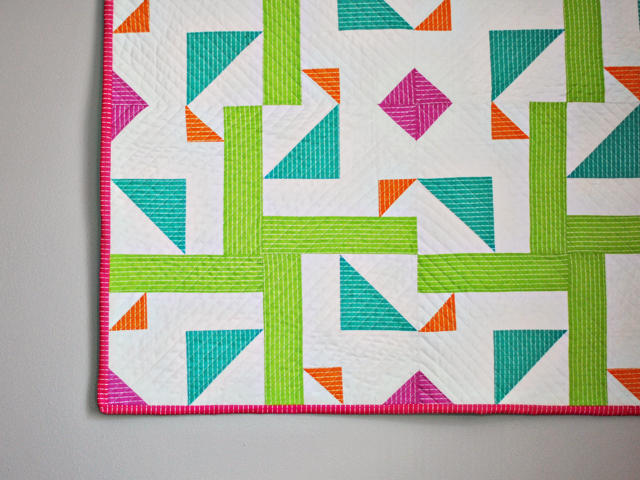 Love the lime green :) Great quilt and the backing fabric works perfectly! As I have already said I ABSOLUTELY LOVE this quilt. It is just awesome. You'll do great with your ham. There's not much you can do to mess those up other than to overcook them. 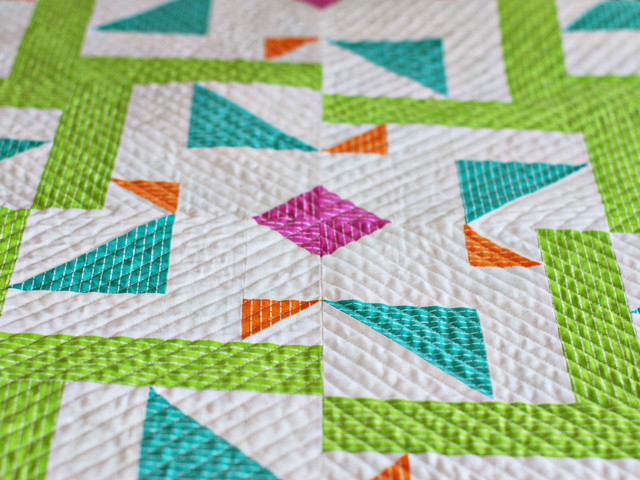 I really like the straight line quilting. Any tips on using the hera marker? I have one but couldn't see the line very well. Holly, I love every single thing about it! Darling! Looks great on your wall. Love what you pointed out about why you chose those stripes. could anyone tell me where that fabric is from? i have been looking for neons for awhile now and those are great.